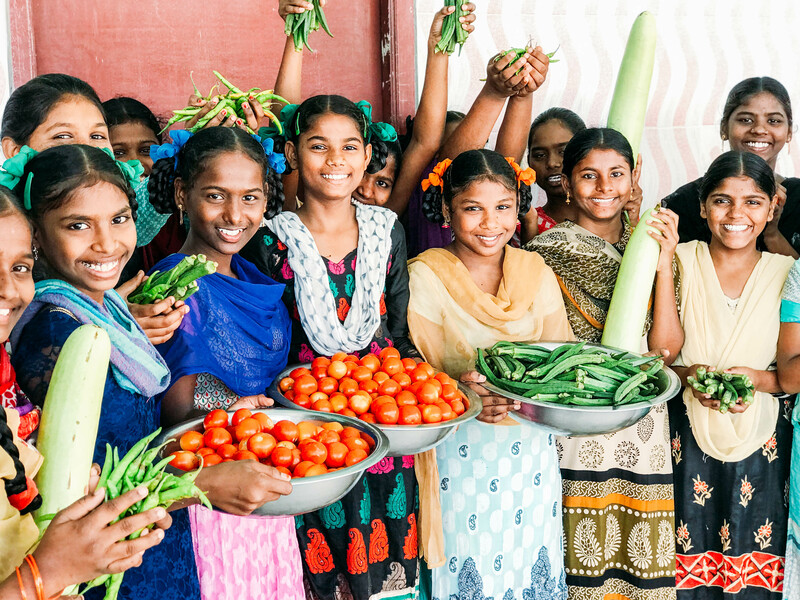 Photo: Girls at our India girls home are happy to show you produce from the recent garden harvests. We are happy to report that our new lentil harvest yielded 2.2 tons earlier this month. We will use some of the lentils in our children’s meals, but we will sell the bulk of of the yield at market in April or May, expecting a net profit of $995 which will enable us to buy other food items for the children. We are also thankful for an abundant harvest from our rooftop box gardens and other campus gardens which occurred at the end of December. 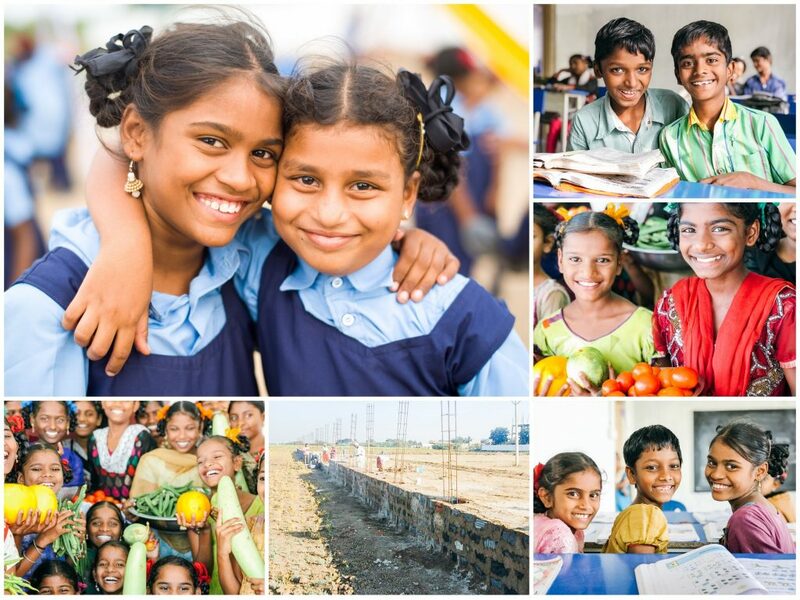 We gathered 408 pounds of eggplants, 452 pounds of tomatoes, 88 pounds of green chilies, and 82 pounds of curry leaves, giving us a net profit of $621 in savings realized from funds we would have otherwise spent at market for these vegetables needed for meals at our girls home and boys home. Our local team will plant more crops in our gardens in July or August, looking forward to another abundant harvest in November or December. After a relaxing Christmas break, all of our children started back to school at the end of December. We currently have 74 children enrolled at our on-campus primary school (ages 6-13) where they are studying their native Telugu and Hindi languages, English, math, science, and social studies. We also currently have 24 older children (ages 13-16) who are attending higher classes off-campus where they are studying their native Telugu and Hindi languages, English, math, natural science, physical science, and social studies. Both our primary school students and our older children are preparing for their final exams in April by putting in extra hours of study and attending tutoring sessions. We are very proud of all of our children’s diligence and hard work as they pursue their education. Prisha came to live at our girls home last year when she was 9 years old. She is from a very impoverished family, and her mother tried to provide for her because her father was an alcoholic. Even so, he also tried to help provide for his family by working as a construction worker in their small village. However, he could not find enough work in the village, so he traveled to another city to find more work in order to feed his family. When her husband was away trying to find work, Prisha’s mother was pregnant and went to live at her own mother’s house. While Prisha’s father was in another city working in construction, he suddenly became weak and sick and his co-workers took him to the hospital where he received general treatment, but he was eventually diagnosed with tuberculosis. The doctors did not know how to treat his condition, thus he died in the hospital. Shortly after this tragedy, his wife gave birth to Prisha, yet now she was a single mother without an income. She tried to find work for daily wages for awhile, and then she remarried another man who had lost his wife and had a son. But after a short time, Prisha’s stepfather did not want to care for her anymore and wanted to abandon her. Prisha’s mother pleaded with him to change his mind, but he did not listen so her mother left Prisha with her grandfather. Prisha’s grandfather was a very old man and he could not do the work he used to do as a hotel dishwasher. Prisha used to go to the hotel to help him, but after awhile he lost his strength and was unable to walk. Her grandfather began to ask his relatives for food every day while Prisha still went to the hotel to wash dishes. Lastly, construction on a new security wall around the one acre of adjacent land to our main campus will be completed in April. We are thankful for this security improvement because this land is where our playground and athletic field are located, and we want our children to be happy and safe as they enjoy the recreational facilities due to many concerning security issues we have witnessed in the area over the years. * Story names are changed to protect our program participants.